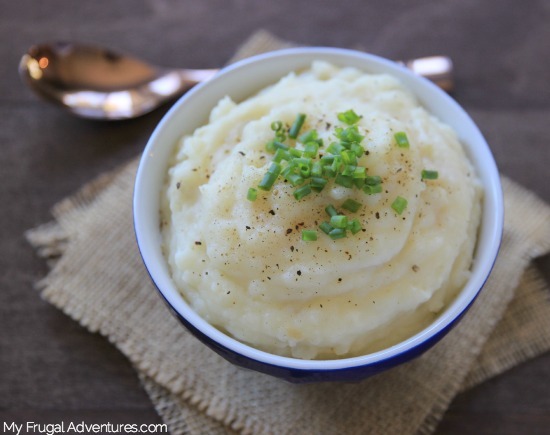 So this is an easy recipe- you just need to go and grab your butter churn first and then…. Ha! Just kidding. 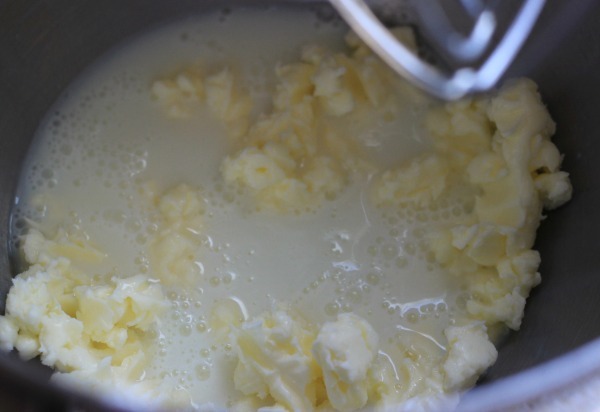 You won’t believe how easy peasy it is to make your own homemade butter. It takes about 9 minutes or so to do and a grand total of one ingredient. Now you might be saying why would I want to bother with making butter when they sell it at any grocery stores, all ready to go in lovely little bricks? Well the first thing is that I rarely find things I can buy at the store that taste as good as homemade. The second thing is that you know precisely what is going into your body. In this case, heavy cream and that is it. 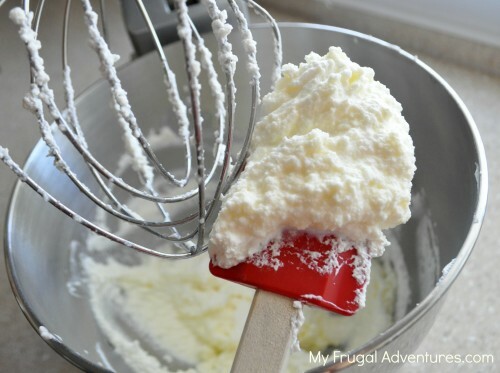 To make butter is super easy- you simply need to get heavy whipping cream. 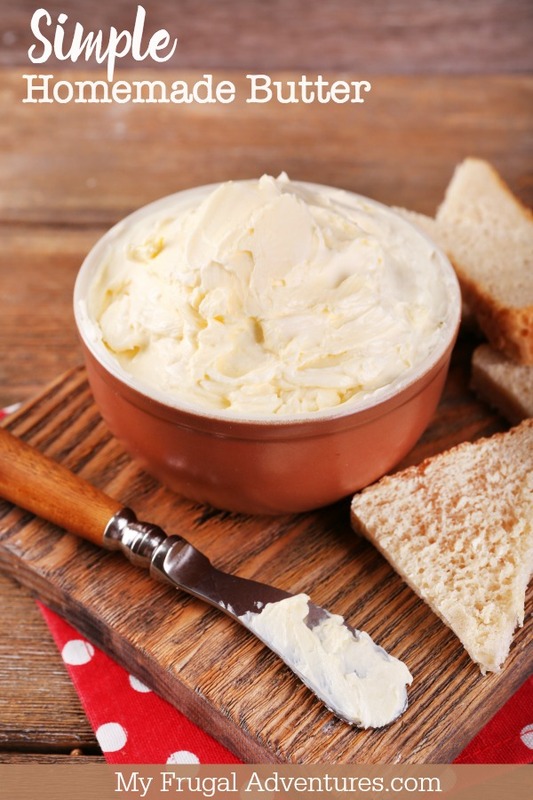 Get whatever you like- organic or conventional but your butter will typically taste better with a higher quality cream. 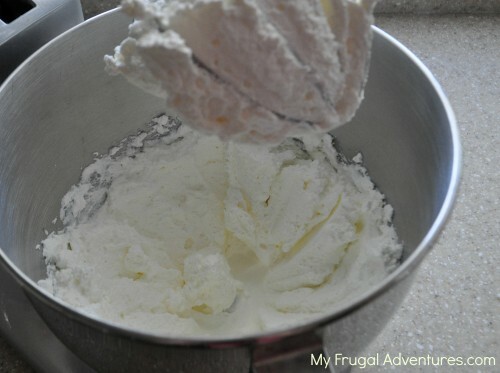 Make sure your cream is very well chilled in the fridge and pull out your stand mixer. 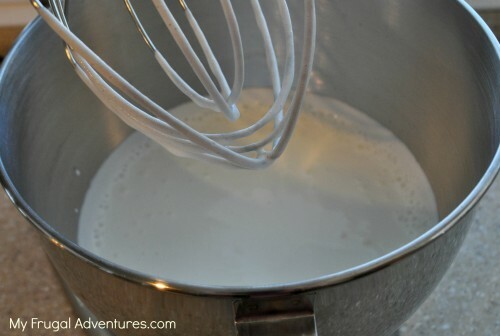 Out your whisk attachment on and turn the mixer to medium high- about a 5 or 6 on a KitchenAid. Now after about 2 minutes it should look like this…. um… heavy cream. Don’t worry. After a few more minutes you should have something like this. The cream will start to get a yellowish tint and it looks like a small curd cottage cheese to me. And now your bowl will have some yucky murky stuff at the bottom. That’s ok. That is buttermilk so you can use that for another recipe later. Right now we want as much of the liquid out of the butter as possible. So put a wire strainer on top of a large bowl and dump the butter inside. Push gently on the butter to squeeze as much liquid out as possible. Make sure that your butter doesn’t touch that liquidy stuff- you want a large enough bowl to keep the liquid off the butter. Now you are closing in on the finish line. 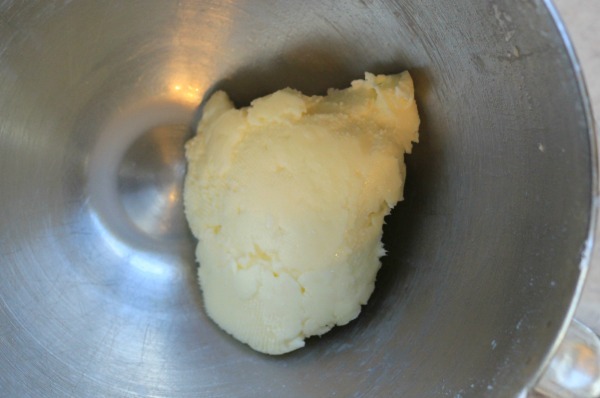 Just pop that butter back into the mixing bowl and mix for another minute or so until you see lovely creamy butter. You might want to smoosh that through the strainer again. You have lovely butter plus some buttermilk for another recipe. 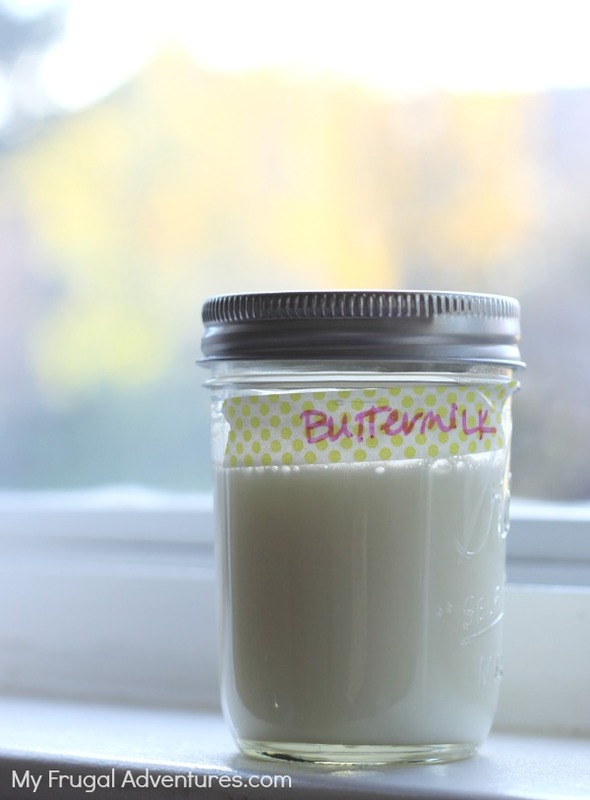 I like to save the buttermilk in a mason jar for pancakes or whatever. This butter should last about 2 weeks in the fridge or if you rinse the butter with cold water it might last just a little longer. Add herbs, lemon zest. orange zest, lime zest, honey, pepper… whatever you like. I added finely chopped dill and lemon zest for corn on the cob tonight. Chives would be delicious with potatoes, Cayenne and Worstershire would be delicious on steaks, Garlic and chives for veggies on the grill… How about blue cheese and worstershire for burgers? And on and on. 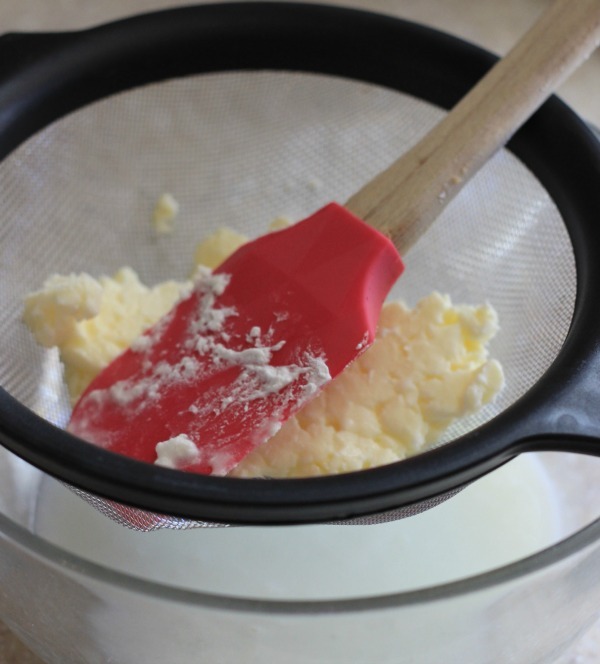 The trick to butter is that it takes on odors from other stuff in your fridge so you want to protect your butter by putting it in a Tupperware, a Butter Crock, or roll it into a log in wax paper. So go grab your mixer and make yourself some butter! Yum yum! 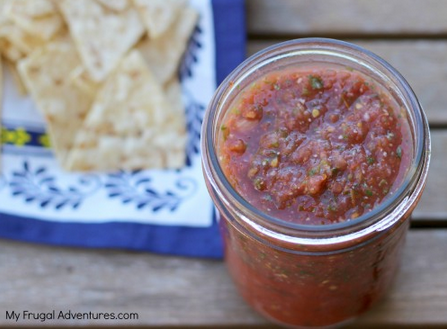 Easy Homemade Salsa recipe– this is SO good! Thanks for this great tip! I picked up some butter the other day at the store and was thinking how expensive the organic butter is. Thanks! Yes organic butter is expensive! Now that I know it is this easy and relatively fast to do, I will start making my own. Thank you so much!!! THANK YOU!!! I am loving your recipes…keep them coming! Oh thanks Jen, I appreciate the encouragement! It is fun to let the kids make the butter. 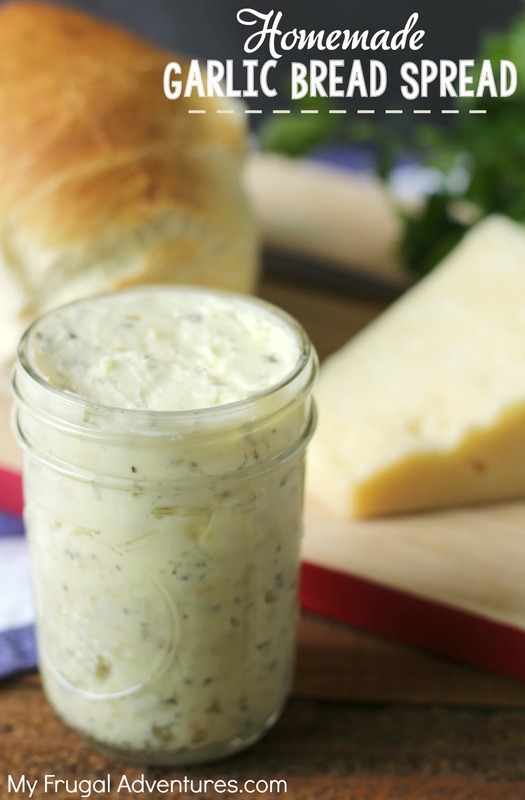 Put the cream into a jar and let them shake, shake, shake or roll, roll, roll. Susan, I have heard of people shaking butter in a jar. My understanding is that it takes about 15 minutes? That might be a bit too long for some children. Awesome! Quick question. How spreadable is the butter right from the fridge? Charla, I find it very creamy.